Nearly 15 years ago, my grandma gifted me with an unfinished wood curio cabinet. It was my first piece of real, brand new furniture, and it is a piece I still cherish and am proud to have in my home! If you have a curio cabinet, then I am sure you feel the same way about this place to keep your most treasured, beautiful pieces. I varnished the cabinet and proudly displayed it in my apartment, filling it with all of my favorite heirlooms, many of which my grandma had passed down to me. She was a stylish lady and these pieces have a modern yet timeless look that work well in my modern style home. 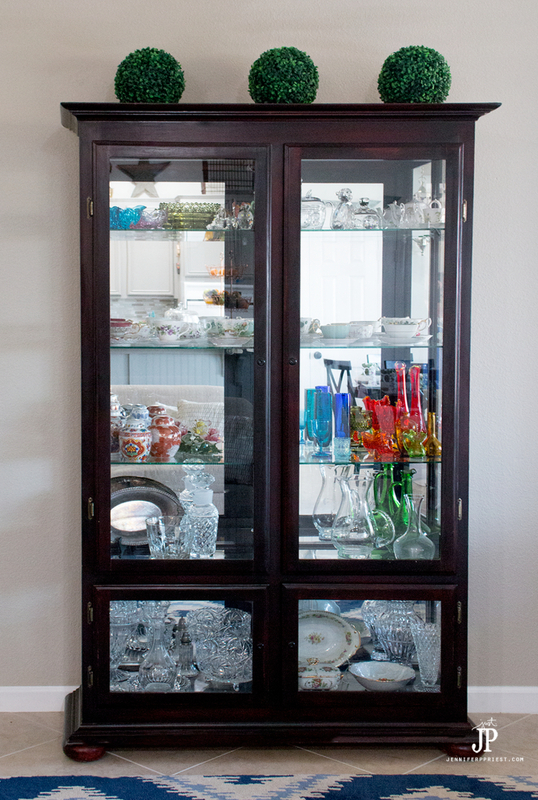 A curio cabinet isn't a “grandma” piece of furniture! The wood on this curio cabinet withstood multiple moves and the harsh, dry desert climate thanks to my exclusive use of Pledge® brand products on it. Pledge® Lemon Clean Furniture Spray, Pledge® Orange Clean Furniture Spray , Pledge® Multi Surface Everyday Cleaner with Glade® Rainshower® are great for annual cleanings of the inside of a curio cabinet like this, and also safe and hard-working for everyday use. When you love your home and furniture in it, it's easy to keep it beautiful with Pledge®. I learned how to care for a curio cabinet from my grandma. 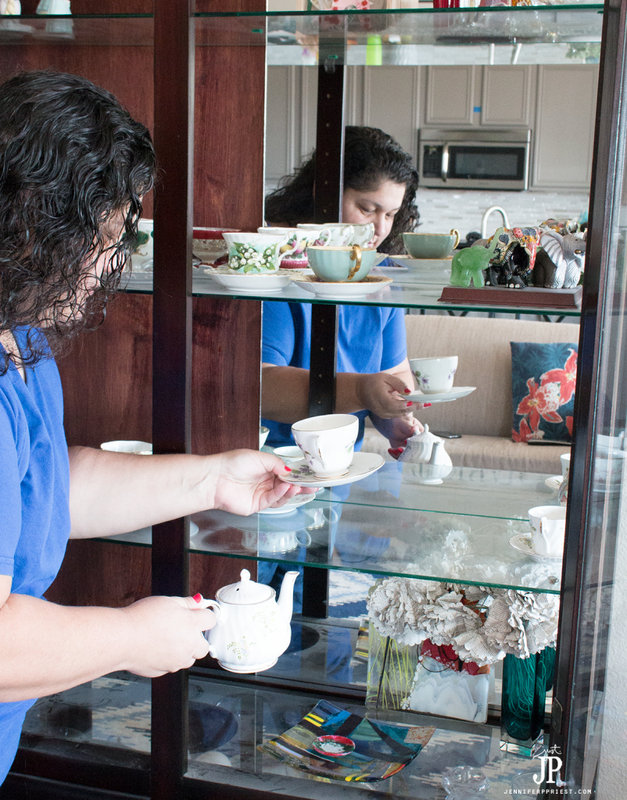 She has passed on, but her cleaning tricks for mixed material furniture, like a glass and wood curio cabinet, live on. 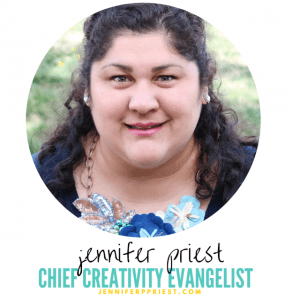 Today I am going to share them with you to help you create a modern curio cabinet you can be proud of: How to clean a curio cabinet every day and for a deep clean. About once a year it's necessary to deep clean the curio cabinet and everything inside. No matter how well you dust the cabinet, dust can still settle inside the cabinet over time. 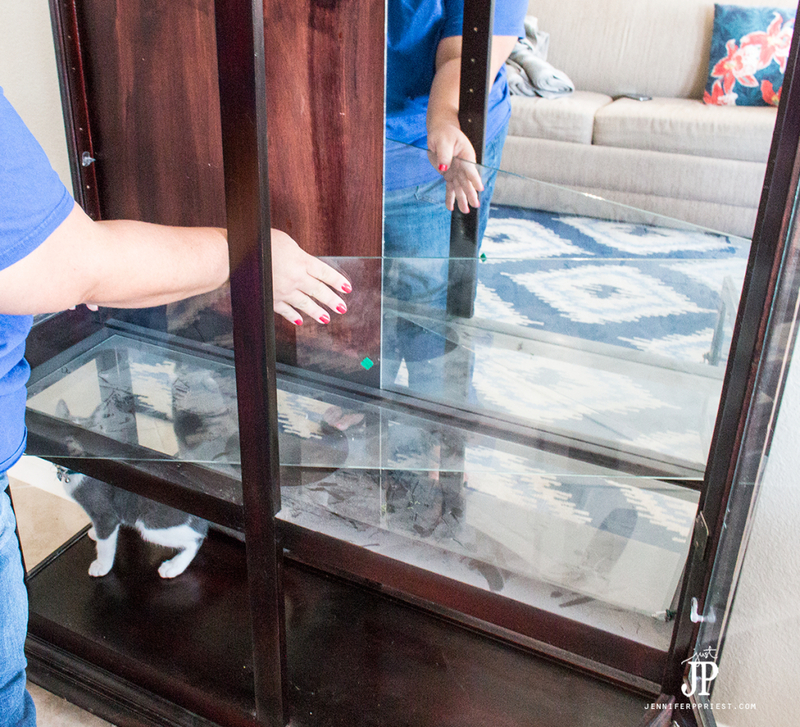 The first step is to remove all of the items from inside of the curio cabinet. I usually transfer them to my kitchen counters and kitchen table. Read labels and sort the more fragile items to one side. 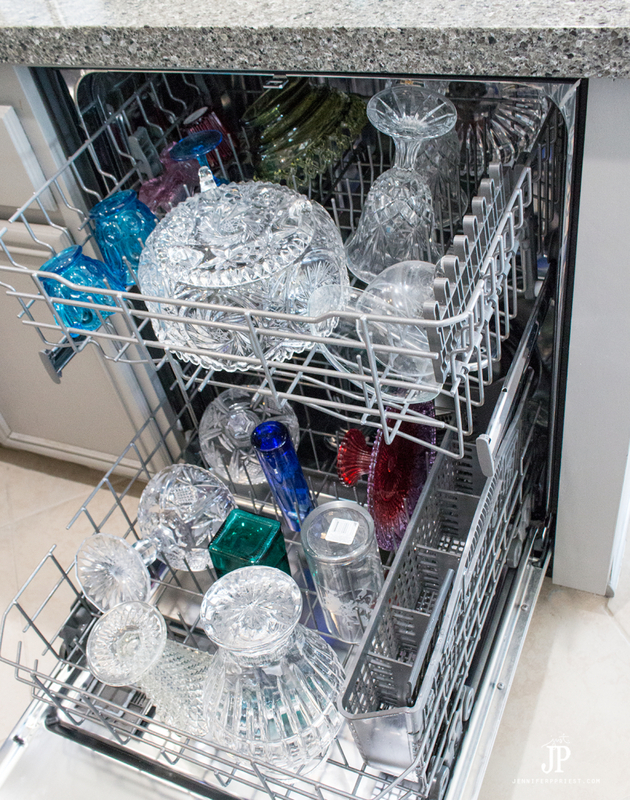 Run the dishwasher safe items through the dishwasher. 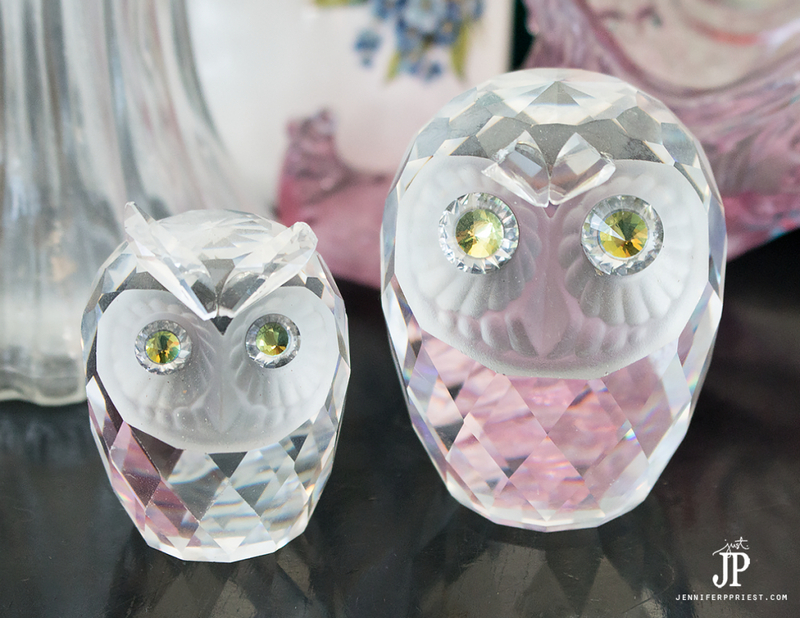 Hand-wash the next set of items with hot water so they will dry crystal clear. You can hand dry them with a lint-free towel. Finally, gently wipe off the no-wash items with a soft cloth. 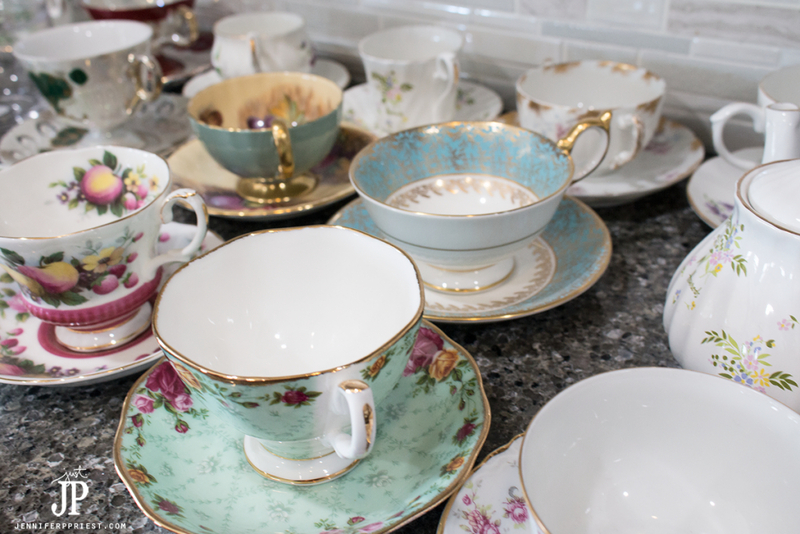 If the item is metal or silver, choose the proper cleaner for that type of item. You can also use this as a chance to look through your curios and get rid of any that you no longer like or that might be damaged. 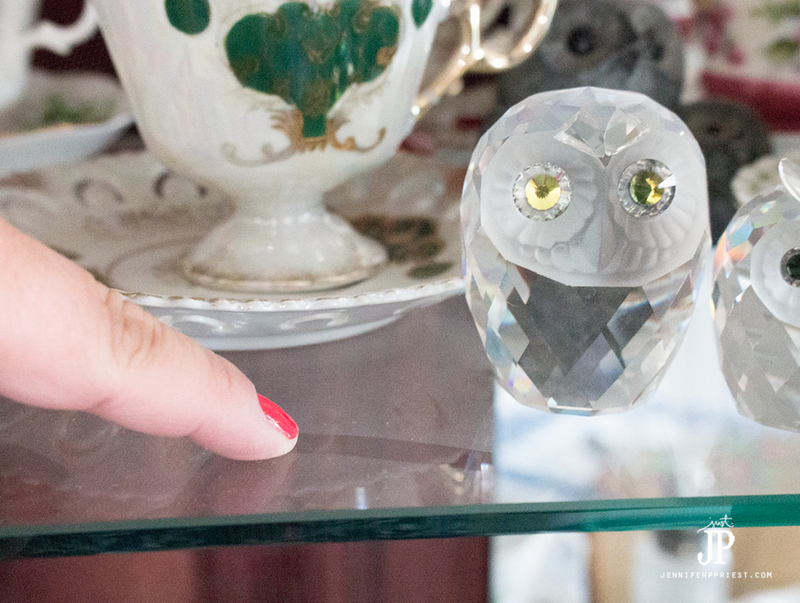 During this cleaning, I noticed some damage on a crystal owl and decided to donate it to charity. 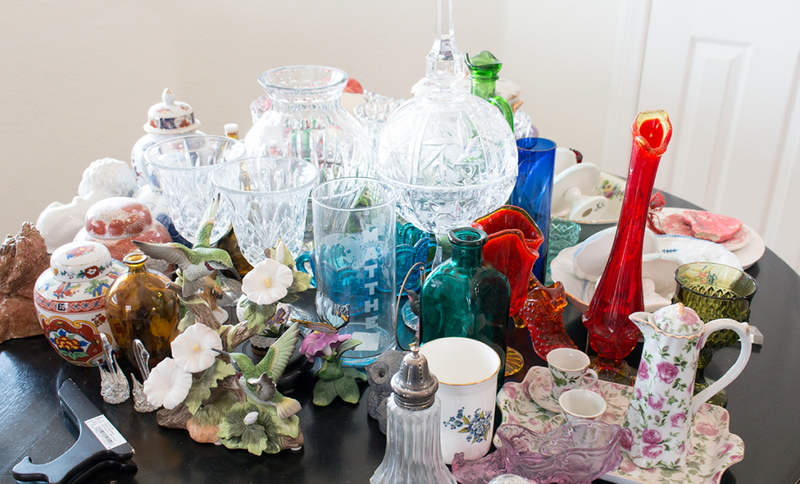 Once the curio cabinet is empty, it's time to start cleaning the inside. Check for any damage that needs to be repaired, such as chipped corners of the glass shelves or split wood. Make repairs if needed. The next step is to remove all of the glass shelving from the cabinet. I usually lay it against the wall with towels between each glass shelf. As you remove each shelf, clean with Pledge® Multi Surface Everyday Cleaner with Glade® Rainshower® and a microfiber dusting cloth to remove all the dust and fingerprints from the glass. 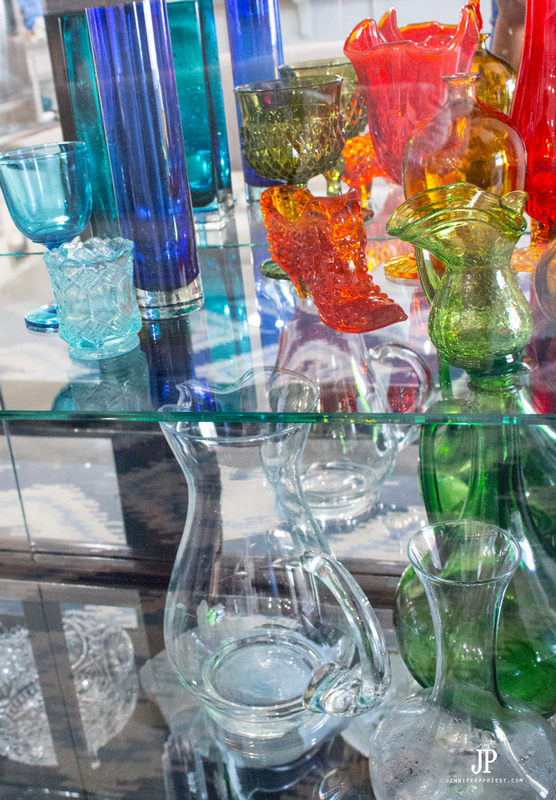 Be sure to clean both the top and the bottom of each shelf since the bottom of the glass can hold and attract dust. Next, clean all of the wood elements on the curio cabinet with Pledge® Lemon Clean Furniture Spray or Pledge® Orange Clean Furniture Spray and a microfiber cloth on the inside and outside of the cabinet. If you live in a dusty area, you might need to switch out the cloth during this process as it becomes saturated with dust. 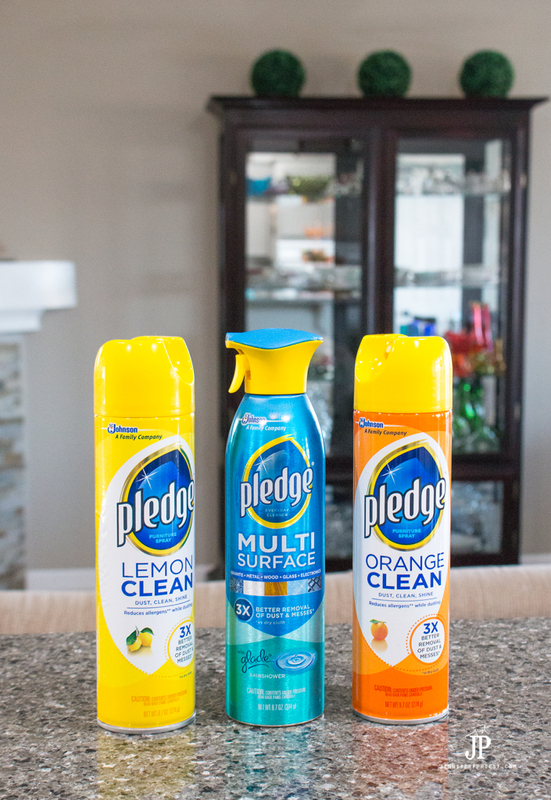 I love the smell of Pledge® Lemon Clean Furniture Spray or Pledge® Orange Clean Furniture Spray after cleaning like this! 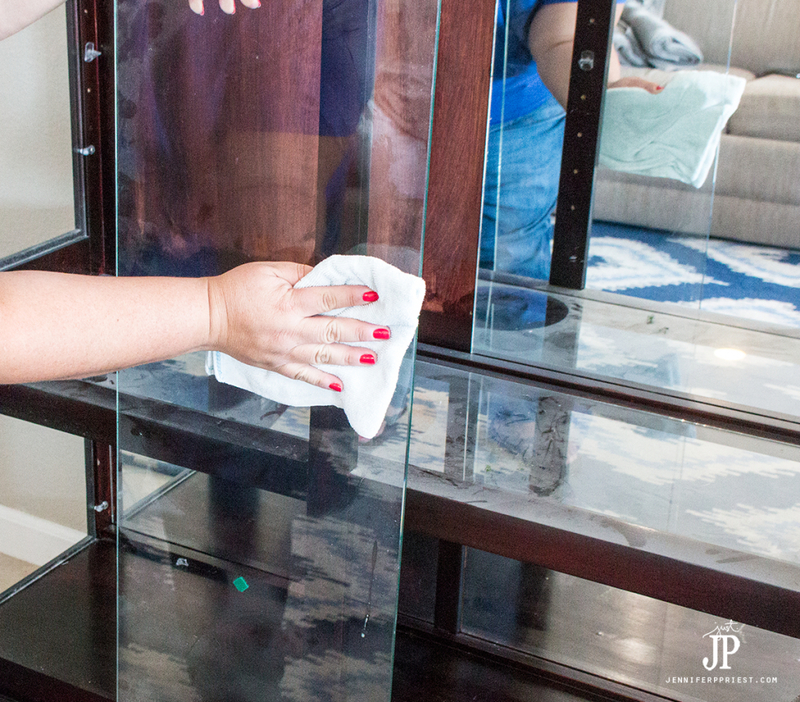 Next, clean the mirror back and glass side panels of the cabinet with Pledge® Multi Surface Everyday Cleaner with Glade® Rainshower® . 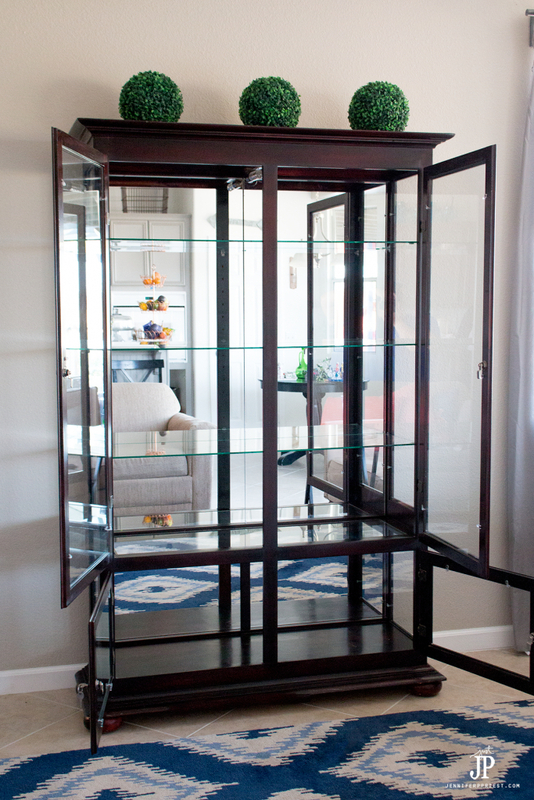 Once the main body of the curio cabinet is clean, you can replace any shelves that were removed. Be sure to wipe any fingerprints from the shelves that might have been transferred while moving the shelves. Arrange and replace all of the curios on the cabinet. Everything will be sparkling and gorgeous! 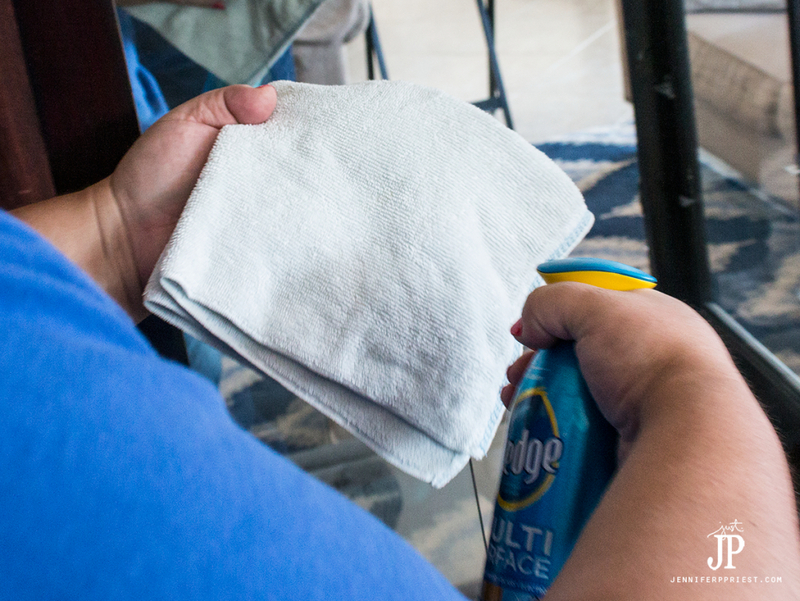 I love Pledge® Multi Surface Everyday Cleaner with Glade® Rainshower® for everyday cleaning because I can clean the glass and the wood at the same time quickly and easily. Every few weeks I'll clean just the wood on the curio cabinet with Pledge® Lemon Clean Furniture Spray or Pledge® Orange Clean Furniture Spray to help further moisturize the wood. It takes about 5 minutes to dust the curio cabinet every week. I just love how classy it looks and how Pledge® makes everything inside sparkle – it's definitely time well spent! 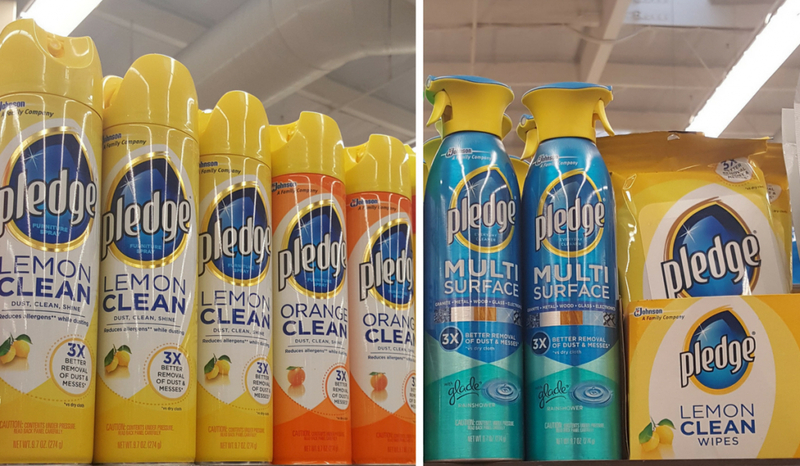 For more info about Pledge® Lemon Clean Furniture Spray, Pledge® Orange Clean Furniture Spray, or Pledge® Multi Surface Everyday Cleaner with Glade® Rainshower®, visit the Pledge® Facebook Page . 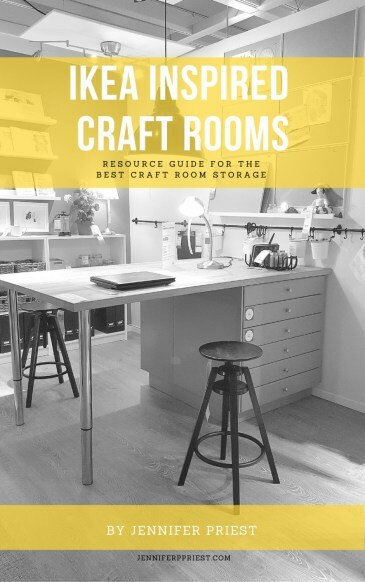 What's your favorite piece of furniture in your house? Share your tips for how you keep it clean in the comment section below. Thanks for the great tips! You cabinet is gorgeous.